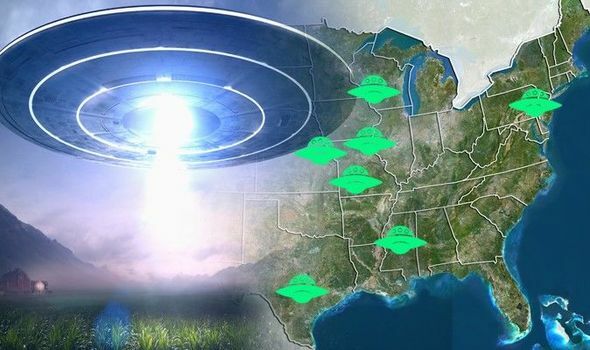 There were SIX further UFO sightings reported to MUFON yesterday. A witness said they and a friend also saw two bright orbs over Plum City, Wisconsin, on Sunday. They both watched as they discussed it on mobile phones. The report said: “I realised that what I was looking at was something that I have never seen before. Yesterday, a witness in Grand Forks, North Dakota, also saw two bright lights.Their report said: “I’m still trying to figure out what these lights in the sky were. “I’m in the city limits, but around eight or 8.30pm, I saw two more stars moving in the sky. “I just came inside right now to report that. What is it? “I never heard about this from anyone else. MUFON has not released any footage, despite the couple claiming to video the event. They said there were other witnesses and they saw a similar event in 2016. Yesterday, in broad daylight, two people claim to have seen the bizarre spectacle of 25 blue or white bubble-like orbs with wings that were in a formation together, over Kansas City, also in Missouri. The report said: “Plain as day and clear as a bell we saw 25 orbs in a frenzy and all working the same area. “These objects or orbs were kind of clear to blue in colour. “They initially looked to be big bubbles and then my friend and I both noticed that these orbs had small wedge-like wings on them. They tried to film them, but the camera would not work, and they faded away. An equally bizarre sighting was reported by a couple in Mississippi. Their report said: “My boyfriend was driving along Goodman Road (302) through Horn Lake, Desoto County, Mississippi towards Olive Branch, Desoto County, Mississippi. “It was around midnight. I noticed lights in the sky coming from the south east. “We noticed the aircraft was flying very low and slow. “It flew low and slow like a helicopter, however we had the sun roof open and could hear no noise. “It was a rectangular black box shape similar to a bus which was very visible as it crossed the road. “There were what appeared to be four orange-yellow lights on both sides, all spaced apart in a straight line. MUFON is the world’s largest organisation dedicated to UFO research, and it keeps a database of global sightings. It is investigating the cases, but admits that most reports it received can be explained an man-made aircraft or natural phenomena.